Hi Laurie, thanks for visiting Rachelle’s Window. You are one of the most prolific book bloggers I’ve seen, with not one, but two blogs. Tell us a bit about your two blogs. I’ve been blogging steadily for over two years now. When the economy tanked late in 2008 I suddenly became unemployed. Thankfully, I had been with Verizon long enough that I had my points and basically decided to accept the severance package. I worked at several different jobs over the next 18 months, then decided to retire when my husband and I took a look at our finances and found out it was actually costing us more, with all the driving around and meals on the road, than I was actually netting in my paycheck – discouraging! I wanted something interesting to keep me “off the streets and out of trouble” Haha! I could finally indulge my passion for reading. That led me to become a reviewer for Coffee Time Romance and a few months later for Night Owl Reviews. Being a reviewer, led me to begin experimenting with blogging. I met some wonderful authors on a few discussion boards who graciously consented to let me interview them on my little fledgling blog. We were very supportive of each other. My blog grew and soon I was quite busy! I started another blog that was dedicated entirely to author interviews. During that time (2010-2011) I was also a tour host for several virtual book companies. 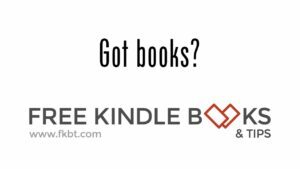 My blogs were growing but there was a lot of overlap and wanted to find a better way to differentiate them while still meeting my personal goals of helping authors get their new books noticed. So, January 1st 2012 I decided to split the blogs so that one would feature books that had paranormal elements within them and the other would feature books without significant paranormal elements. That’s been working well, so far. What do you find rewarding about book blogging? I LOVE to read and I LOVE finding authors who offer the types of books I enjoy at a price that doesn’t break the bank. Most rewarding for me is sharing that with others who have similar interests. I personally LOVE the evolving changes in the book industry and I just want to do what I can in my own small way to foster its growth. You definitely are fostering the love of reading. Your schedule is packed for both blogs several months out. How do you coordinate all of the authors and books you are featuring? How much time do you spend answering e-mails and social networking? LOL! It’s pretty much a full-time job – many of the organizational and time management skills that I used routinely at Verizon work well for me still. I have a spreadsheet and calendar that helps me keep track of what is scheduled and I’m always tweaking my system to make sure things run smoothly and features get posted on time. I enjoy trying new things and learning new ways of doing things. I do admire your organizational skills. What do you enjoy most about working with authors? I admire that they have the diligence and perseverance to be able to write down stories in a compelling and entertaining manner. I am in awe that authors are able to pour their hearts and souls into their stories, then have readers, critics, and reviewers judge the merits of their works – sometimes harshly. It amazes me that there are writers from all walks of life. Most of the authors that I have featured on my blog are generous, likeable and so creative. I just have so much respect for what they do. Did you design your blog pages yourself? Yes, well sort of. It’s all pretty much self-taught. I have zero artistic ability – literally, I can’t even draw stick figures that look cute, so when I discovered MyMemories scrapbooking software earlier this year, I was astounded at how easy it is to use and how intuitive it is, especially considering it’s inexpensive price (less than $40). I like being able to quickly change the look of my blog on a whim, and playing around with graphics is the icing on the cake as far as I am concerned. Oh, I never thought about using scrapbooking software. Great idea! How hard is it to coordinate giveaways? Do you occasionally find it frustrating or do you have the system down pat? It’s not difficult. I am a fanatic about wanting them to run smoothly and letting the readers know exactly what is up for grabs. I am always trying to find ways to make the maintenance easier and more efficient for me while packing the best promotional opportunity possible for the author. What are some expectations you have from authors who would like to be on your site? I feature authors on my blogs by invitation only. With unknown (to me) authors I will read their book blurb, look at their cover image and usually read the free sample (or at least a few pages of the sample). The book doesn’t necessarily have to appeal to me personally. After all, we all have different likes and dislikes, but the blurb and sample should be well-written and decently edited. I try to keep my blog rated PG or milder so I really don’t wish to paper it with covers that are really hot and steamy, besides that, I participate in many huge blog hop events hosted by Kathy at I Am a Reader, Not a Writer Blog which are “family friendly”. I want my feature posts to reflect the personalities of the authors I feature. The most important expectation I have is that the materials I need to set up the post are returned to me in a timely manner. Other than that, it’s my job to set up attractive layouts that meet the needs of my featured authors. To my way of thinking, I am doing this to help and support the authors who are guests on my blog – for me it’s a labor of love. And Laurie, believe me, your labor of love is well appreciated. Thank you for featuring me on your blog yesterday. Okay, now for some fun questions. 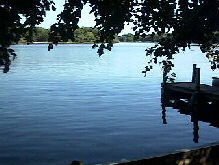 We have a bench down on our pier by the lake. When the weather is nice, that is my favorite reading spot. Otherwise, anywhere and anytime. My kindle and backup kindle go with me everywhere. What makes you decide to read a book? The cover? The first pages? Personal recommendation from a friend? Or just random browsing? First, I rarely pick a book if the genre isn’t appealing to me personally. The blurb is extremely important to me in deciding whether or not I want to read the book. I love a pretty cover, and it may entice me to read the blurb, but if the blurb bores me, or is too long, or is too short, or simply doesn’t grab me, then I move on to the next selection. It’s highly unlikely I will read a book if I don’t connect via the blurb. Next, I’ll read at least a few paragraphs or pages from the Kindle free sample. The story generally must grab me quickly. This is so difficult to quantify because I notice that I may think a story starts off wonderfully, whereas, some other reviewer will claim it was slow and dragged for her. I almost forgot to mention another big consideration for me. I have to constantly take into account how many other books I’ve promised reviews for and how loaded up my reading schedule already is before I promise another book review. I feel terrible when I’ve promised a review by a certain date and I am not able to meet that commitment on time. Right now, for example, I’m behind schedule and feeling the pressure. Mostly, it’s pressure I put on myself, but I know I’m disappointing authors waiting for reviews, and I hate being in that position. One of my resolutions this year is to be more discerning about promising reviews. Unfortunately, I am seeing quite a few books that I truly would love to read that I am saying “No” to. The really good ones should stay on my radar screen for later. Favorite genres and types of books? I enjoy most fiction genres. I read for entertainment not self-improvement. There are too many books that I want to read and just don’t have time to read. I’m very picky about the books I choose for review. I don’t really want to waste time reading something I don’t personally enjoy. What is your favorite beverage while reading? Favorite snack? I love a properly mixed fountain diet coke but I try to drink mostly flavored water. My favorite snack is probably dark sweet cherries in season, otherwise microwave popcorn. My husband, our cats, living in our little lake community, reading and blogging! Laurie, I’m so glad you could visit with us today. If people want to get in touch with you, what is the best way? For authors who would like to be featured on my blog it’s best to fill out my Feature Request Form. I usually reply back within a few hours, or within 24 hours at the outside. Just click the Authors Wanted graphic on my blog sidebar or click this link. My review schedule is currently over-full so unfortunately, I am having to turn down most requests for personal reviews. I do give review preference to authors who have been or will be featured on my blog when selecting books to review for Night Owl, Coffee Time, WLC or IBC. PLEASE do not send me your unsolicited book and ask me to review it. 99.9% of the time your email, including the book, will be deleted. Unfortunately, I no longer have time to respond to emails containing unsolicited books. Feel free to email me with your pitch and I will take time to politely respond but don’t send me the book unless I’ve requested it or you have told me you wish to gift it to me without any expectation of a review. Thanks!!! I’m a book blogger who delights in helping authors promote their books by featuring them on my blog via Author or Character Interviews, Guest Posts, Giveaways and Reviews. I support all authors but talented Independent and small press authors who write engaging stories that are well-edited hold a special place in my heart. I enjoy most fiction genres, especially Science fiction, Fantasy, Horror, Mystery, Thriller, Romance, and Suspense. I have enjoyed a lifelong love of reading and like to have a variety of books in different genres always on hand. I like reads that flow smoothly and logically from one point to the next. When reviewing, I make the effort to give my personal, honest appraisal of the book without giving away any particulars of the story line. My goal is to provide valuable information from a fresh, candid view point. Copy this code to your website to display this button! Hi Laurie and Rachelle. Great interview! Your lake community sounds wonderful. Actually sounds like a small, artsy community a few miles from me. Hi Dariel - Thanks for commenting. We have lived here for over 14 years now. I never tire of the quiet and watching the lake change. We're only about 8 miles from Edom, Texas. It is a little artsy town out here in East Texas. It's also home of The Shed Cafe, consistently voted one of the best places to eat in East Texas. We go there for breakfast most mornings to meet up with friends and neighbors. Hi Laurie, it's sure fun to interview the interviewer. My blog contest is for the interviewees, so if you can get the most distinct comments for July, you win my book. That's a reverse also. Way to build the life you want, Laurie! Your service as an indie book reviewer is a valued one. Thanks for doing what you do to support the indie world. And for raising the bar on quality indie reads. Hey Laurie. Great interview. I bet this is a little bit different being on the other side of the interview. Well, Laurie speaks! How terrific is that? I think you'd get through an adversity, Laurie! 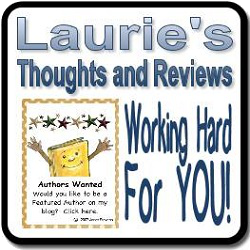 I can personally attest to Laurie's energy, diligence and commitment to authors! Nice interview. It's great getting to know more about you, Laurie. And way to go on creating the life you want for yourself! Hey Laurie - Great interview! Thanks for sharing a bit of yourself with everyone. Hi Laurie and Rochelle, ditto what Dale said. Laurie, it's always a pleasure to be featured on your blog. And I wish I were as organized as you. This was fun learning more about you. Carol - Thank you! I am so appreciate of the many authors who make what a do such a pleasure! Catie - I sure appreciate seeing you again...thanks for stopping in to say howdy. Catie and I both began blogging and reviewing about the same time. Catie posts author features, giveaways as well. She writes insightful reviews and is a champion of indies, too. Dale, T. and Edie - You guys are the best. You've been so supportive of me and my bloggy stuff from the beginning. You are a big reason I do what I do....Thanks for always sparking my interest in indie books and keeping those flames burning with super new books I can feature. Hugs to you!! Phyllis Zimbler Miller emailed me directly because her comment wouldn't post when she tried to leave it earlier....she asked if I might post it for her... Here is her comment. "I have recently had the pleasure of working with Laurie on providing books for blog hops plus writing an upcoming interview for her non-paranormal blog. The bottom line is that she is a dream to work with -- excellent email communication, she checks with authors to see if things are all correct, she is enthusiastic about helping authors. If this were a review for her on Amazon with 5 stars being the best, I would give her 6 stars." Nice to see the tables turned and have the blogger/reviewer interviewed! Well done Rachelle and great interview! Fantastic interview, ladies! And I'm jealous of your beautiful reading space (the outdoors one). Oops, typo--and blogger doesn't let us edit. Laurie, I have to say being on your blog was really fun and you made everything so easy for me. I don't have time to read many blogs but yours is one not to miss. It's easy to tell you put a lot of time and care into them. Echoing the others, thanks for letting us take a little peek into your day! Hey Laurie, great interview! It's nice to learn more about you. Your reviews are always honest and carefully thought out. I certainly appreciate the ones you did for my books. Keep up the great work! Very inresting insight into your life, Laurie. Oh, and I want that deck as my reading room! Hi, Laurie and Rachel. Great interview. Rachel, I'm a new follower. Nice to meet you. Rachel, very interesting questions :) I love it!